The International Federation of Surveyors (FIG) believes that effectively functioning land administration systems are of central importance to ongoing economic development. 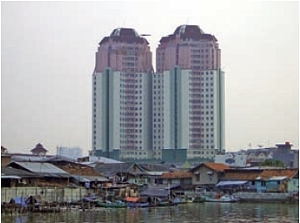 These systems provide guarantees of land tenure which enable economic activity and development. There are many elements to land administration systems, and many organisations involved in both the public and private sector. As with any chain, the system is only as strong as its weakest part. It is therefore appropriate that FIG, as the leading Non-Governmental Organisation representing surveyors and land administrators, has set as its central focus for the 2007–2010 period the task of ‘Building the Capacity’. This requires capacity assessment and capacity development, both of which are vital to building sustainable capacity. 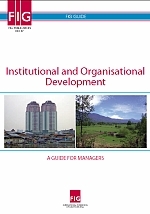 This publication is the result of a FIG Task Force on Institutional and Organisational Development leading to a guide for managers to build sustainable institutions and organisations. FIG has committed itself and its members to further progress in building institutional and organisational capacity to support effective land administration systems. Such work is particularly about developments at the organisational level, but this cannot ignore the societal and individual levels. Progress requires honest self-assessment of organisational and system strengths and weaknesses. Effective management action must follow, to build on the strengths and address the weaknesses. FIG commits itself to support managers and professionals in this task, working with governments, national bodies and individuals. This guide provides a tool in this regard. The document builds on several other FIG Publications, including the Bathurst Declaration (FIG, 1999); the Nairobi Statement on Spatial Information for Sustainable Development (FIG, 2002a); Business Matters for Professionals (FIG, 2002b); the Aguascalientes Statement (FIG, 2005); and Capacity Assessment in Land Administration (FIG, 2008). This work would not have been possible without the contribution of the Task Force members – Santiago Borrero, Richard Wonnacott, Teo Chee Hai, Spike Boydell and John Parker – as well as many other individuals who have reviewed, commented on and improved draft outputs, completed questionnaires and the like. FIG is very grateful to all of them. Effectively functioning land administration systems, providing guarantees of land tenure, are of central importance to ongoing economic development. In many countries, however, land administration systems are not sufficiently robust to deliver effective land tenure, and this can limit or restrict economic development. This impacts the global economy, as well as the economy and the welfare of the citizens of the country involved. These key findings led FIG to the view that a number of key components need particularly to be considered by those who want to build sustainable institutional and organisational capacity in land information systems – these components are described in this publication. This publication is written for use by practitioners. It aims to provide individuals and organisations with an increased understanding of capacity building, in particular building the capacity of organisations to meet the increasing demands placed on them. 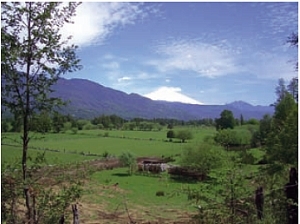 In this way, it complements FIG Publication 41 – Capacity Assessment in Land Administration (FIG, 2008), which considers the capacity of the system. The essence of the publication is the checklist for managers at Section 3. This is developed further in Section 4, which draws together the key lessons from FIG’s work and experience and presents them in the form of key issues which must be addressed, along with examples from around the world. Section 2 provides context for the challenges of institutional and organisational development, including defining some of the terms used. use the material in Section 4 as a basis for focusing improvement activity. This section provides some background to the issues of capacity building and land administration, to ensure that users of this publication have a clear understanding of the terms used. Land administration is a central part of the infrastructure that supports good land management. The term Land Administration refers to the processes of recording and disseminating information about the ownership, value and use of land and its associated resources. Such processes include the determination of property rights and other attributes of the land that relate to its value and use, the survey and general description of these, their detailed documentation, and the provision of relevant information in support of land markets. Land administration is concerned with four principal and interdependent commodities – the tenure, value, use, and development of the land – within the overall context of land resource management. Figure 1 below depicts how these elements link together to provide a sustainable land administration system. Figure 1: A Global Land Administration Perspective (Enemark, 2004). the building of new physical infrastructure; the implementation of construction planning and change of land use through planning permission and granting of permits. The importance of capacity development in surveying and land administration at the organisational level was usefully quantified in Great Britain (OXERA, 1999) by research that found that approximately £100 billion of Great Britain’s GDP (12.5% of total national GDP, and one thousand times the turnover of OSGB) relied on the activity of Ordnance Survey of Great Britain. With such very significant numbers, as well as the central importance of sound land management, the need for sustainable and effective organisations in the field of surveying and land administration is clear. For the purposes of this document, institutional development relates to the enhancement of the capacity of national surveying, mapping, land registration and spatial information agencies and private organisations to perform their key functions effectively, efficiently and sustainably. This requires clear, stable remits for the organisations being provided by government and other stakeholders; these remits being enshrined in appropriate legislation or regulation; and appropriate mechanisms for dealing with short-comings in fulfilling the remits (due to individual or organisational failure). Putting these elements in place requires agreement between a wide range of stakeholders, in both the public and private sectors, and is a non-trivial task. Figure 2: A Performance Management Model (HMT, 2000). Of course, defining and implementing the detail in any one of the above items is a significant task, and all must be in place if the organisation is to succeed. By putting the appropriate mechanisms and measures in place, and continuously challenging and improving them, organisations can ensure that they effectively turn inputs into outputs and, more importantly, the required outcomes (such as certainty of land tenure). All organisations need continuously to develop and improve if they are to meet, and continue to meet, the needs of their customers and stakeholders. In the land administration field, there are many examples of under-resourced organisations unable to respond effectively to stakeholder requirements, thereby leading to a lack of access to official surveys and land titling (leading to unofficial mechanisms being used, or a total breakdown in efficient land titling). There is a need to provide appropriate assistance to enable the necessary capacity to be built and sustained by such organisations, given the key role of their operations in underpinning national development. A range of methods exist, including releasing internal resources for this work (if suitable resources exist), or external support. Managers and leaders need to give a strong focus to the following nine issues if they are to develop sustainable institutions and organisations. Some key questions to consider are provided below; more detail is provided in sections 4.2–4.10. Are you clear what the role of your organisation is in the land administration process and how it interacts with that of other organisations? Are you clear on the roles and responsibilities of the other organisations with which you need to interact? Do other organisations and stakeholders agree your understanding of roles and responsibilities? Does the division of responsibilities enable effective delivery of land administration functions? Does legislation support this division of responsibilities? Do you, as a manager within the land administration system, understand the extent of the end-to-end processes involved in the system? Do you appreciate the benefits that can be delivered by those involved in the entire process working together effectively? Are you assessed on the overall effectiveness of the land administration system for your jurisdiction and its citizens? Do you give a clear lead, in word and action, to your staff to work to improve the effectiveness of the overall system? Are the necessary informal and formal agreements in place between organisations to support cross-organisation working? Is there the necessary culture of working together to support cross-organisation working? Do you have a clear understanding of the current roles of the different sectors – public, private, academic – in the land administration system? Is the allocation of roles clear and objective? Does the allocation of roles support the effective operation of the land administration system? Is the allocation of roles agreed with leaders of all sectors? Is the allocation of roles kept under review and adjusted as necessary? Do your words and your actions consistently reinforce the need for joined up collaborative working throughout your organisation and with other relevant organisations? Do your organisation’s key targets explicitly include elements that can only be delivered with input from other organisations? Is staff performance measured with reference to the overall success of the land administration system? Are the successes you report internally and externally related to the need to deliver overall system goals? Does your organisation have strong and effective links with policy makers? Do these links give you a voice that is heard in the policy development process? Does the policy development and maintenance process sufficiently recognise operational realities? Are the links sufficiently formalised that they will survive changes of key individuals? Does policy making on land administration matters in your jurisdiction take place in a way that ensures that the voices of all stakeholders are heard? Do stakeholders have confidence in the fairness and robustness of the policy making process, so that they can accept the results? Do professionals play a key role in commenting on and shaping policy development? Does the law covering the land administration system provide a clear framework of requirements whilst avoiding stipulating inputs and methods? Does the law appropriately recognise the reality of different types and formality of tenure? Are the various types of law, regulation and instruction used appropriately to address issues of principle, policy and procedure? Do education and training courses for surveyors reflect the reality of professional practice? Are training courses regularly reviewed with key input from practising professionals? Are staff from your organisation invited to participate in other organisations’ training courses – and do staff from other organisations participate in your organisation’s training courses – to assist in the spread of information and in building relationships? Do training courses provide students with a clear overview of the entire land administration system and the various organisations involved, before providing detailed education in particular components of it? Do training courses include examples of successful collaborative working between organisations and individuals? Do you complete a structured learning process with those involved at the end of a project? Do you share the results of this learning with others who might benefit from it now or in the future? Do you use web-based systems to share and gain learning? Section 2 has provided a general description of land administration, a general model for organisational development and a description of a sustainable organisation. This Section provides a description of nine key elements which FIG’s work leads it to believe need to be present for such an organisation to exist, and which (from FIG’s research) are often not in place. It includes examples of where they have been successfully implemented in different countries and states. Make clear statements defining the responsibilities of each level/ sector. Provide transparent leadership ‘from the top’ to encourage collaboration in both top-down and bottom-up ways. Define clear roles for the different sectors, including the private sector. Ensure that the network of individuals and organisations has a sufficient voice with key decision makers for land administration issues to be taken fully into account in all central policy making. Facilitate policy development and implementation as a process that is open to all stakeholders, with all voices being clearly heard. Provide a legal framework that enables the use of modern techniques and cross sector working. Offer relevant training courses that clearly explain, encourage and enable cooperative and action-based working by organisations, within a clearly understood framework of the roles of each level/ sector. Share experiences through structured methods for learning from each others’ expertise and experiences, with this learning fed back into organisational learning. 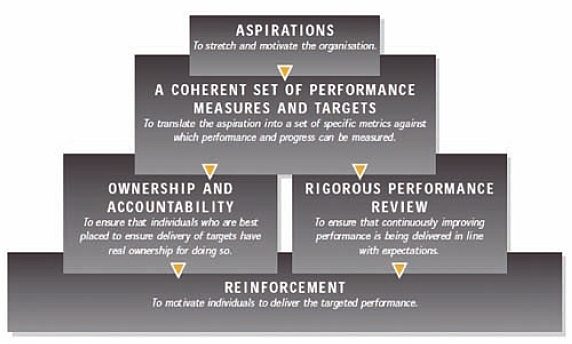 These statements cover all five elements of the performance management model illustrated in Figure 2. The following sections elaborate on each of the nine issues, providing further description and giving examples of work that has been done in the relevant area. The sections are intended to assist managers of organisations seeking to increase sustainable capacity. The sections should generally be used following completion of a self-assessment questionnaire to determine particular areas of concern, or used directly by managers familiar with their organisations. Section 3 has summarised the questions connected to each issue. Land administration is a far-reaching aspect of government activity and many different organisations are involved in policy development and the delivery of its different elements. This often includes organisations at supra-national, national, regional and local level. Many aspects of the work will be laid down in formal legislation, but much of this legislation will focus on the work of particular organisations or parts of the system. staff in organisations will be unclear of their role and interactions, and will not know which other organisations to contact. All of this will lead to confusion, frustration, delay and wasted activity. In a truly sustainable system, each organisation involved in land administration knows what its role is – and what it isn’t – and which other organisations it needs to work with to deliver overall objectives. This is clear to stakeholders – politicians, land owners and occupiers, private sector firms, citizens, staff – meaning that the right work is done in the right places. This in turn means that scarce resources aren’t wasted on correcting confusion and that the agreed goals of the land administration system are delivered more effectively. Australia has three levels of government – national, state and local. Australia’s constitution gives responsibility for land-related matters to the states: for instance, all land registries are the responsibilities of the states. Working through a range of committees and councils with representation from different levels of government, it has been possible to develop a collaborative model. For mapping, it has been agreed that the national mapping organisations will be responsible for small scale mapping of the country (smaller than 1:100,000); and states will be responsible for medium and large-scale mapping (1:50,000 and larger). For example, in the State of Victoria, there are defined responsibilities and roles established with local government bodies and some regional authorities as to whether they will undertake large scale mapping or provide data elements to the state which then becomes the custodian of that data on behalf of the local government body or authority. In this way, the responsibilities of all levels of government are clear – and those responsibilities have been shared between different levels of government in an effective way. In Europe, the INSPIRE Directive (http://inspire.jrc.ec.europa.eu/ ) provides a legal framework for consistent management of spatial data throughout the 27 member states of the European Union. This is designed to ensure that data analysis and use is effective. Previously, analysis of major river systems required data from several countries to be joined together, raising difficulties with inconsistencies in data formats, terminology, coordinate reference systems and the like. 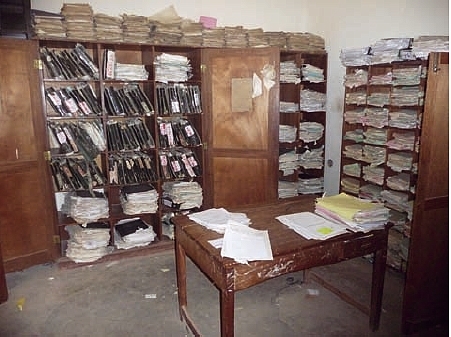 Data collection and management remains a national function, but the Directive requires clear responsibility for the maintenance of different datasets to be allocated, metadata about the datasets to be available in a consistent format in geoportals, and the technical elements of data sharing to conform to international standards. In this way, data can be shared more effectively, reducing duplication of effort, ensuring that data is fit for the required purpose, and allowing better decisions to be made more quickly. If the answer to any of these questions is ‘no’, engagement with other organisations and/or law makers, along with clear, improved communication is essential. In general, written descriptions of roles and responsibilities, presented in easy to understand ways (such as flowcharts showing who is responsible for the different activities) will allow the identification of unclear areas, overlaps and gaps, at which stage dialogue can address and resolve the issues. Changing the law takes time, but a focus on clear written agreements of who does what will allow earlier resolution of issues. The Australian example above shows how a State government and local government have agreed a sensible allocation of responsibilities so that, collectively, they fulfil legal and user requirements effectively. Many different organisations are involved in land administration. There is an understandable tendency for each organisation to set targets and priorities based around its own activities. This provides staff, managers and stakeholders of that organisation with assurance that it is working efficiently and effectively. Such an approach, however, can limit the overall effectiveness of the system. Property valuation activities can increasingly be completed from data derived from aerial photography and satellite imagery, improving the efficiency of the data collection and valuation processes and removing the time-consuming need for ground inspections. Such ground inspections, however, enable the data collectors to gather the ownership and date information essential for property tax administration. Organisations which oversee the end-to-end process, therefore, often require the retention of ground visits in the valuation process, as this improves the overall effectiveness of the tax assessment and collection process. In a truly sustainable system, the various organisations involved in the land administration system work together to agree shared objectives which improve overall system efficiency. This is challenging work for managers, who may often be assessed and rewarded based on the efficiency of their organisation. This emphasis on end-to-end effectiveness therefore needs to be reinforced by clear messages and actions from governments and administrations, to make clear that such joining up is both required and expected. Such joining up may include consideration of organisational mergers, but it is important to remember that organisations do not necessarily need to merge to be able to work together effectively. Often more important is a clear demonstration by managers and leaders that they understand and want to use the benefits of formal and informal collaboration. This may include the putting in place of Service Level Agreements or other agreements between organisations. This top down demonstration, complemented by appropriate target setting, gives staff in the different organisations the confidence to think widely about the opportunities for overall system improvement, and to work together to deliver this. In Northern Ireland, work on a Geographic Information (GI) Strategy for the province began in 2001 with the bringing together of key experts and stakeholders for a three-day structured process of agreeing key priorities. This led to the publication of a strategy and the setting up of a cross-sectoral Steering Group, with sectoral groups drawn of individuals from different organisations progressing proof of concept studies (including one which cut the time taken for utility companies to ascertain what other cables and pipes were under a road ‘from six weeks to six minutes’). Centrally, the Steering Group also oversaw the development of a GeoPortal, GeoHub NI™ (www.geohubni.gov.uk). In 2008, the Steering Group agreed that the key elements of the strategy had been completed, and an inclusive process which included workshops, blogs and formal Ministerial approval, led to the publication of a new Northern Ireland GI Strategy for 2009-19 http://www.gistrategyni.gov.uk) which has been approved by the Ministerial Executive[cabinet]. Implementation is being managed by a cross-sectoral Delivery Board, guided by a GI Council of very senior officials and managers from the public and private sectors. Are the necessary informal and formal agreements between organisations in place to support cross-organisation working? If the answer to any of these questions is ‘no’, it is vital that you gain a wider understanding of the land administration system and engage with other senior managers to demonstrate the very real performance benefits of cross-organisational working. The benefits of working collaboratively throughout the land administration system are well documented. Your work can therefore often start with looking at experiences in other jurisdictions, and proposing pilot projects to demonstrate real benefits, and that they can be delivered in a reasonable time and for a reasonable cost. In this way, stakeholder resistance, based on concerns that the operation of the system will be disrupted by the effort to join up more, can be reduced. The Northern Ireland example shows how the bringing together of stakeholders started by structured work in a neutral environment. The benefits of collaboration are now sufficiently well understood in Northern Ireland that such structures and safeguards can be relaxed. Because of its fundamental importance to economic and national development, the land administration system – and most of its components – is in most jurisdictions managed and operated by the government. Ultimately, the task of allocating roles rests with government as the custodian – on behalf of the citizen – of an effective land administration system. In many jurisdictions, the private sector delivers key elements of the land administration system. The role of government in allocating responsibilities and tasks, however, can lead to the private sector feeling that it is seen as secondary by the public sector. The academic sector is also pivotal in maintaining sustainable capacity: it is this sector which designs and delivers training courses – both at the start of people’s careers and, increasingly, in lifelong learning. These courses must deliver the required information, and set the required culture of effective collaboration. Otherwise, the professionals involved in the land administration system will not receive clear and unambiguous messages about their role in the wider system. In a truly sustainable system, government (on behalf of citizens) retains overall responsibility for the land administration system. It engages with representatives of all of the other sectors involved to agree each sector’s roles and responsibilities. The government then allocates roles and tasks between sectors in the most effective manner, and keeps this under review to ensure that changes in capacity and capability lead to adjustment of allocations as appropriate. The government may choose to document the roles of the different sectors in legislation, or may choose to provide clear statements on a non-legal basis. It then acts in accordance with these statements, including when considering governmental support in its different forms. In New Zealand, the legal mandate for administering the central components of the land administration system rests with the public sector, in particular the government agency Land Information New Zealand. All public sector organisations, however, outsource their land surveying work. This has been a longstanding practice in cadastral surveys, where licensed surveyors complete surveys which are ratified by the Surveyor General and then lodged in the central government database (currently known as Landonline). Private sector surveyors therefore hold invaluable information about the practical impacts of legislation and regulations and, individually and collectively (for instance, through a professional body such as the New Zealand Institute of Surveyors), provide key practitioner input to ensuring workable regulations which enable effective and timely surveys by suitably skilled practitioners. The public sector policy makers recognise that individuals and organisations in the private sector are key stakeholders – and work with them on an as-needed basis and through the professional bodies whom they view as key allies in the continuous drive for improvement and increased effectiveness. Professionals working in hydrographic surveying and nautical charting operate within a framework of national and international law. It is therefore important that the training of Hydrographic Surveyors properly reflects changes in the law and in technology. Given the important international elements, the International Hydrographic Organisation (IHO) has a lead responsibility for regulating and certifying Hydrographic Surveying courses. IHO also recognises the important expertise of practising professionals. It has therefore, together with FIG, formed an International Board for the Standards of Competence of Hydrographic Surveyors and Nautical Cartographers that includes representatives of FIG and the International Cartographic Association (ICA). It is this International Board that decides on the recognised standard of Hydrographic Surveying and Cartography courses. The Board also reviews formal continuing professional development schemes and arrangements for Hydrographic Surveyors seeking recognition at international level. The International Board is therefore a good example of governments, professionals and academia working together to ensure effective professional development. – Do you have a clear understanding of the current roles of the different sectors – public, private, academic – in the land administration system? If the answer to any of these questions is no, the work of the different sectors involved in the land administration system is likely to be ineffectively organised. A number of forums will probably already exist for discussion of effective allocation of activity. Professionals in the public, private and academic sectors will probably all be members of the relevant professional body, for instance. This will enable peer-to-peer discussions of the current arrangements and how they can be improved. The professional body is likely to have contact with professional bodies in other jurisdictions, allowing a comparison of arrangements across countries. This information can be collated and proposals for effective allocation drafted for discussion. Wide engagement at an early stage will be essential, and careful positioning of the work to ensure that it is seen as driven by concerns of public policy and not a sectional group (section 3.6 is also relevant in this regard). The IHO example above shows how sectors within a community can collaborate effectively, each respecting the role and responsibilities of the others, to put in place and sustain an effective way of working. Within an organisation, managers may state that working across and beyond the organisation is important. But if staff performance is assessed on their individual effectiveness in their particular role, collaborative working will not develop in practice. In a truly sustainable system, words, actions and systems all fully support a cooperative approach to activity, both across teams and business units within an organisation, and between organisations. The key influence on the approach taken in practice is the organisational culture – that unspoken, unwritten understanding of ‘the way we do things round here’. Elements that need to be considered in the organisational culture include: the way that people are rewarded (for individual performance or for team effort); the symbols that are used (the success stories reported in formal publications, the news in staff briefings, even the pictures in the office reception area). And all of this needs to be continuously reinforced by all levels of managers in their words and their actions – for instance, that managers of organisations are seen to meet regularly together to agree inter-organisation liaison. In many countries, a variety of organisations have been created and set apart from central government – for instance, as Government Owned Companies, Commercial State Bodies and the like. In some countries, they have been moved out of the capital city for reasons of regional balance. It then requires specific effort to make sure that the organisations work effectively together, treating each other as customers and suppliers or, even more effectively, as partners in a joint venture to make the best possible land administration system. In a number of countries, the organisations responsible for mapping, valuation and land registration have been brought together into single organisations by governments which have recognised the benefits of close working. This has happened, for instance, in many Australian states, in the Caribbean and in Northern Ireland. Organisational mergers are not essential – collaborative working is very possible between organisations – but they provide a very clear statement that the different organisations rely on each other to deliver the outcomes required from the land administration system. In Land & Property Services in Northern Ireland (www.lpsni.gov.uk), the key organisational targets are set using a balanced score card approach. A Management Committee of managers from all directorates meets monthly to review progress against all of the organisation’s key targets, and to reassign resources and funding between targets as necessary to ensure ongoing balance between them. This process recognises that all areas of the business have a key role to play in the achievement of corporate objectives, and that such decisions can in many cases be taken by managers without needing the intervention of Board members. If the answer to any of these questions is no, your actions and your words will not encourage and cajole staff to work together across and beyond organisational boundaries. You will therefore need to consider how your actions can support such collaborative working. Actions speak louder than words – informal contacts and/or formal agreements with other organisations will provide a clear framework for collaboration. Shared targets will link this approach into organisational and individual success measures. And the successes that you choose to highlight can further reinforce this. Mergers are one organisational solution to the challenges of working across organisational boundaries. Committees are another. Both have been summarised in the examples in this section. Many organisations are involved in delivering an effective land administration system. These organisations may be working, individually and collectively, very effectively. However, it is also important that the legal and policy framework in place fully supports operational delivery, and that the framework is sufficiently responsive to political, economic, social and technological changes to enable sustainable development. In many countries, policy making and operational delivery are seen as distinct activities with limited communication between them. This is likely to lead to policy that is not grounded in practical reality, and operational delivery which is constrained (and sometimes impossible) because of inappropriate policy. Excellent social policy objectives will not be delivered if the proposed implementation is cumbersome or unworkable. In a truly sustainable system, policy making and operational delivery are seen as parts of the same activity, with constant communication and iteration between the two parts to ensure that policy meets the needs of the government and its citizens, but that the policy can be faithfully and completely delivered. It is therefore essential that policy makers receive and take fully into account the constructive, well-articulated views of operational delivery staff and vice versa. Policy makers receive very many representations to introduce, adapt or repeal policy. It is therefore vital that those responsible for delivering the land administration system – in the public and the private sectors – speak with a strong, coherent voice, and use a variety of channels to influence the policy makers. In the Netherlands, the development of law, policy and operational aspects of the spatial planning aspects of a National Spatial Data Infrastructure (SDI) has taken place in a collaborative manner. It has involved three levels of government – national, provincial and municipal. The 2006 Spatial Planning Law was driven largely by planning considerations, but its reliance on SDI was quickly seen and the Law was drafted to provide a sound legal basis for the SDI. Regulations created under the Law provide a specific legal basis for the SDI. Considerable collaboration also took place in the development of standards to support the operation of the SDI. A top level project group consisting of representatives of municipalities, provinces, several departments of central government, delivery organisations and lawyers managed the work, setting up separate research groups of experts as required. The standards will now be reviewed on a 2-yearly basis, in a process managed by Geonovum, the Dutch geographic standardisation foundation. This will be done in close collaboration with the main spatial planning stakeholders, in a transparent process, to ensure commitment and effectiveness. The creation of a standardised core tenure model has long been discussed by land administration professionals and international agencies of the UN. There was general agreement that such an international model would be valuable, whilst recognising the different legal systems and processes in different countries. Both the policy makers and the professionals recognised that they would not be able to create an effective model separately, so a process of collaborative working involving UN-HABITAT and FIG was agreed. This involved stakeholder discussions and expert workshops to create a draft Social Tenure Domain Model (STDM) of particular relevance to developing countries. This has been formally reviewed for UN-HABITAT by FIG. A more generally applicable model, the Land Administration Domain Model (LADM), has also been developed by FIG experts, and is now being taken forward through the broad consensus process of ISO to create an international standard, which is expected to be complete by 2011. The ISO process has brought together experts from public, private and academic sectors. All involved agree that the resulting document is much stronger than would have been possible without this collaboration. Information provided to a Task Force member by the Project Leader of the LADM work in ISO. If the answer to any of these questions is no, there are real risks that policy will not develop and adapt to allow effective delivery. You need to ensure that policy makers hear the voice of the delivery organisations, and respect it as an important, objective voice. This may most effectively begin through making personal contacts, and through showing where specific, straight forward changes can make a real difference. Through this process, the benefits of policy and operations working together will become clear and can be communicated on the basis of examples. Further formalisation can then be put in place to be able to withstand the moving on of key individuals. Working in this way delivers better results, and completes the process more quickly despite the slower start as engagement is put in place. The Netherlands have found this, as has the international community, in the examples above. It is important that those developing policy for land administration, and those delivering the land administration system, clearly hear other voices. Individual citizens are key stakeholders in the system and have to believe that the system delivers equitably and effectively. Pressure groups also need to have their voices clearly heard and taken into account. The primary role for ensuring this breadth of engagement lies with policy makers. A key secondary role, however, lies with the delivery organisations and individuals, who will engage with individual citizens and community groups on a daily basis in their work. Such individuals need to ensure that such input is provided to the policy makers. This also applies to the development of organisational strategies for individual organisations. Citizens and representative groups need to be convinced that their voices are all heard and taken seriously if they are to feel any ownership of the resulting decisions. Consultation and feedback are critical if successful strategies are to be developed. If stakeholders do not believe that their voices are heard and respected, they will not have confidence in the land administration system and will use other routes to seek to change decisions that have been made. In a truly sustainable system, all voices are heard and priorities are agreed based on all of the voices. Communication and feedback explains why certain ideas cannot be taken forward, so that all stakeholders understand and are able to support policy and organisational strategy. Recent FIG Commission 9 consideration of compulsory land acquisition has found that using the compulsory process is considerably less effective in reaching agreement and acceptance of stakeholders than the use of voluntary methods. Voluntary methods must be formulated to ensure that all stakeholders have a clear voice, and are heard. If all stakeholders understand that a compulsory process will follow unless the matter can be resolved by agreement, this will focus everyone’s minds, but makes it vital that the procedures and professionals involved in the voluntary process ensure that all stakeholders have their voices heard fairly, and that the reasons for the ultimate decision are clearly explained. Prior to 1994 (when South Africa became a fully democratic nation), land ownership was generally restricted to the white population. Some groups were forced out of the areas in which they had stayed for many years, and moved to other areas for various political reasons. Since 1994, the forced removal of communities and individuals and the return of those communities to their original homes or land has taken up a great deal of the time and energy of the Land Claims Commission. For example, a certain area close to the centre of Cape Town has had an unfortunate history of delay (over seven years) in finalizing the return of forcefully removed communities to the area, with little progress having being made because not all of the community interest groups were included in the negotiations from the very start of the process. There has also been a history of acrimony between municipal, provincial and state bodies which has had strong political undertones and has not aided the process. The Commission has found that, in order to make any progress in these matters, it is important to be very sensitive to the needs of all groupings, irrespective of political affiliation or interest, and to involve all groups from the earliest stages of policy making. If the answer to any of these questions is no, stakeholders are unlikely to feel fully engaged in the policy development process and will therefore feel limited ownership of its outcomes. Professionals have a key role to play in improving this process, as they engage with many stakeholders on a regular basis, and are perceived as being interested, expert and objective, meaning that they can speak with the confidence that other stakeholders may not have. It is therefore important that professionals build strong connections with the policy making and shaping process. This will often start through personal links, allowing professionals to show the policy makers and other stakeholders the value they can bring to the process. The South African example above shows the difficulties that can arise when insufficient consultation and communication takes place. Legal frameworks develop over time and take a good deal of time and effort to alter. Legislative capacity is generally restricted, with many pressures for parliamentary time. This means that many countries rely on relatively old legislation to control the land administration system. That in itself is not a problem; the problem arises if the legislation prescribes details of the work to be completed. Legislation is also the highest authority in any jurisdiction, providing the legal framework within which all citizens and organisations must operate. It is therefore important that the law does not restrict or hinder cross-sector working, and is managed in a flexible way so that it can adjust to changes in society and technology. In a truly sustainable system, the necessary constraints of the law making process and timetable are fully recognised, and laws focus on required outcomes. Inputs such as technical matters which change on a regular basis, are managed through regulations or instructions under the authority of the law but which can be changed in a more flexible (but transparent and accountable) manner. If legislation states that angles must be measured a set number of times when completing various elements of cadastral surveys this, by its very wording, means that GPS surveys cannot be used because a GPS survey cannot be shown to conform to the legislation. If the law were to state, by contrast, that the final accuracy of coordinated survey points in the cadastre is to be x centimetres, the Surveyor General or equivalent could stipulate any requirements in regulations and instructions as he or she sees appropriate and necessary; and these regulations could be altered more rapidly. Similarly, many countries are now considering moving (or have moved) to coordinated cadastres without survey marks. If legislation prescribes the form and nature of survey marks, it will need to be altered, delaying the possibility of implementing marker-less cadastres. But if the legislation states that corner points must be recoverable on the ground with an accuracy of y centimetres, the Surveyor General or equivalent can state what is and is not allowable. In the state of Victoria, Australia, the Survey Cadastral Regulations and the Survey Coordination Regulations used to be quite prescriptive, for instance detailing how boundaries should be traversed and measured. The latest regulations are non-prescriptive and leave it to the surveyor to determine how s/he obtains the accuracy required. The surveyor must be able to demonstrate how s/he has verified that the survey meets the required accuracy. The Botswanan Government took early steps after independence, with the 1968 Tribal Land Act which created Land Boards to administer customary land and introduced leasehold arrangements in customary land. The Act was amended in 1993 to keep pace with social and economic changes. The Land Boards were put in place to improve customary land administration, ensure that emerging economic opportunities were adequately catered for in Botswana’s land management system, create capacity for handling the demanding and complex land use issues emanating from the new economic opportunities, and democratise customary land administration. ongoing review of critical issues. If the answer to any of these questions is no, the legal system is unlikely to facilitate the effective operation of the land administration system. It will therefore be important that professionals and delivery organisations work through key contacts (such as government-appointed professional officers) to explain the technical changes that will make the law out of date – and, worse, will prohibit the use of improved technology and techniques. Maintaining links with professionals in other jurisdictions will allow examples to be provided to law makers. The new Australian regulations provide an example of appropriate documentation, as does the Botswana Land Policy. It is important that courses clearly explain the nature of the entire land administration process, and the various organisations and sectors involved, whilst often concentrating on certain aspects. For instance, land survey courses need to explain the land registration system as well as the broader land administration system. This embodies the T-shaped skills principle – that effective practitioners need to have a breadth of understanding across a range of activities, along with detailed understanding of their chosen area of specialisation. This is as equally relevant to start-of-career training courses as it is to lifelong learning courses. Courses must also attempt to embed the concept of the need to work across disciplines and organisations – which can then be developed further as students from the courses go to work for different employers and in different sectors. In a truly sustainable system, those developing training courses work very closely with those in practice and responsible for policy development and operational delivery, to ensure that the courses meet practitioners’ needs in a timely way whilst being firmly rooted in academic knowledge and discipline. Survey courses around the world need to produce students who have the professional and technical capability to complete the work that is required of them. The design of courses must ensure sufficient academic rigour, but also that this is grounded in reality. Courses will therefore need to adapt constantly, recognising societal and cultural norms and evolving market needs. A recent study of education for valuers found mismatches between the professional education and skills of surveyors as provided within academia, and the needs of the professional practice in which the surveyors are employed on graduation. Some of the reasons for this were found to be onerous generic educational requirements imposed by universities, lack of resources, failures in communication, and inadequate guidance by professional bodies as to the requirements of professional practice. A partnership approach between academia, practitioners and professional bodies is found to be able to work effectively, with professional bodies accrediting academic courses on the basis of threshold standards and, overall, on whether the courses prepare students for the profession. By contrast, those courses developed without a strong professional practitioner voice did not produce students who were prepared to cope with the challenges of professional practice. The Problem Based Learning (PBL) approach applied at Aalborg University, Denmark is both project-organised and problem-based. In order to provide for the use of project work as the basic educational methodology, the curriculum is organised into general subjects or “themes” normally covering a semester. The themes chosen in a programme are generalised in such a way that the themes in total will constitute the general aim or professional profile of the curriculum. The themes provide for studying the core elements of the subjects included (through the lecture courses given) as well as exploring (through the project work) the application of the subjects in professional practice. Traditional taught courses assisted by actual practice are replaced by project work assisted by courses. The aim is broad understanding of interrelationships and the ability to deal with new and unknown problems. In general, the focus of university education becomes more on “learning to learn”. A consequence of this shift from teaching to learning is that the task of the teacher is altered from transferring knowledge into facilitating learning. Project work also fulfils an important objective: the student must be able to explain the results of their studies and investigations to other students in the group. This skill is vital to professional and theoretical cognition: knowledge is only established for real when one is able to explain this knowledge to others. In traditional education, the students restore knowledge presented by the teacher. When the project organized model is used, the knowledge is established through investigations and through discussion between student members of the project group. The knowledge, insight, and experiences achieved will always be remembered. If the answer to any of these questions is no, training courses are unlikely to provide students and graduates who can succeed in professional practice. This will significantly reduce the benefits of the education and place additional pressures on the professional accreditation and membership tests of the various professional bodies. Many jurisdictions have good examples of successful collaboration between academia and professional practice, including external examiners from professional practice, and professional body accreditation of academic courses. Professional bodies which maintain links with their peers in other countries will be able to provide such examples, along with suggestions for initial low-risk stages which will prove the benefit of this approach to those who are sceptical. Busy people do not spend sufficient time learning from experiences. This problem increases with the increasing business and personal pressures on us all, and the increasing expectation that instant communication requires instant decision making. It is, however, well documented that collating and using lessons learned from particular tasks can shorten the time to complete future tasks. This process need not be lengthy – but neither should the time given to it be unnecessarily restricted. In a truly sustainable system, proper time is given to a structured learning process which involves all of the affected individuals and organisations. The results are agreed and widely shared to facilitate wide and ongoing learning. The most commonly used project management frameworks require that a Lessons Learned report is completed as part of the completion of a project. In the PRINCE 2 methodology, the Lessons Learned report is generally completed in a workshop which brings together all involved parties and considers what went well, what went less well, and what lessons can be learned for future projects. Many organisations now bring key lessons learned together into a manual for successful projects. The same process can – and should – be easily applied to the development of policy or completion of surveys. The growing numbers of GeoPortals and other web-based tools allow a place to share such learning across countries and continents – the Knowledge Portal developed by the Global Spatial Data Infrastructure Association (GSDI) is one such example (http://geodatacommons.umaine.edu/network/home.php). The portal offers the opportunity for any organisation to deposit and examine documents, find contacts in other organisations around the world, and participate in a range of discussion forums. If the answer to any of these questions is no, you are probably not giving enough priority to learning lessons as a basis for ongoing improvement. The tried and tested techniques around lessons learned, and the burgeoning web-based portals, provide ample opportunity to learn and to share, and this is a crucial element of developing sustainable, effective institutions and organisations.